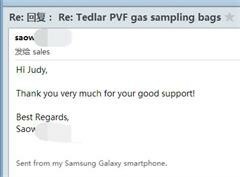 Our company Dalian Hede Technologies and professional companies together researched anddeveloped Devex film with international advanced technology specifically for making high quality gas sampling bags. Devex is very low background, little contamination and good elasticity, can satisfy foreign customers high requirements. can't become hard-brittle when cold like Aluminium-foil(multi-layer) film, it has superb strength and low permeability, meanwhile it possesses excellent chemical inertness and stability. Especially when Aluminium-foil(multi-layer) film cannot meet the requirements and using fluorine polymer film cost too much, Devex gas sampling bag is the best choice. Being detected by authoritative organizations Devex film is superior to Aluminium-foil composite film, so Devex gas sampling bag is of the most highly cost sffective at home and abroad,and widely used by customers abroad. Ideal for sampling and storing H2S, and for low molecular weight compounds such as Methane, CO/CO2, Hydrogen, and inert gases which are not stable in Tedlar, Kynar, or FEP. Water- and vapour-proof, these flexible bags protect light sensitive compounds. Bags are available with several fitting and valve options. They provide up to five day sample stability with minimal absorption. Normal Aluminium-foil multi-layer film is glued of solvent adhesive, can volatile a large number of organic volatile impurities that can pollute the sample gas no doubt, Devex film is glued of environmental protection adhesive, amount of organic volatile chemicals(VOCs)by inner layers is extremely low, thereby avoid the sample gas being polluted and prevent the interference of analysis data. 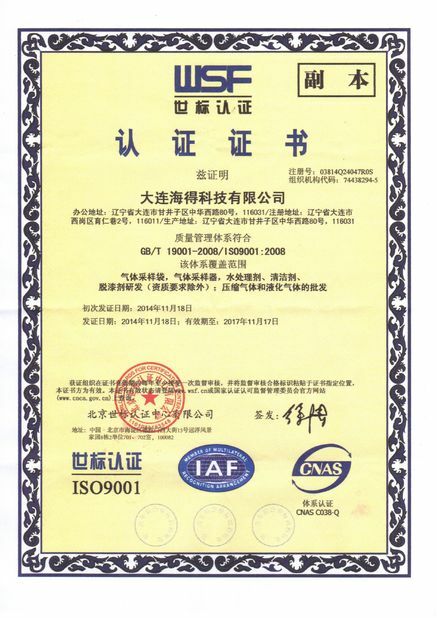 The organic solvent remnant amount of Devex film is 0.1mg~0.3mg/㎡, which is 5% of Aluminium-foil multi-layer film, so Devex film is the ideal high performance substitute for Aluminium-foil multi-layer film. 0.5L, 1L, 2L, 3L, 4L, 5L, 8L, 10L, 15L, 20L, 30L, 40L～6000L or customized size. Devex gas sampling bag can fill the gas being of stable chemical properties, such as: pyrolysis gas, natural gas, coal bed gas, smoke dust gas, ambient atmosphere, technological process reaction gas. It is widely used in petrochemical industry and environmental monitor etc. for gas sampling and save.Devex gas sampling bag can ensure that the low concentration (PPM) component is constant for 1-3 month. Devex gas sampling bag can be used in sampling and detection for non-methane hydrocarbon. Devex gas sampling bag can fill low level of hydrogen(H2), oxyen(O2), nitrogen(N2), argon(Ar), methane(CH4), carbonic oxide(CO), carbonic dioxide(CO2). Devex gas sampling bag is not recommended to use for the gas with high chemical, corrosivity and strong oxidizing property such as: hydrogen sulfide, nitrogen oxides, strong basicity gas and halogens gas or low content component ppb level. Devex gas sampling bag apply to lucifuge sampling for photosensitive gas. Avoid filling pressure higher than 6000Pa. Fill gas until the bag is fully expanded, however, it is not so tense when you press it using your finger. The overpressure filling can cause gas sampling bag burst damage. Keep away from flame and high temperature when filling and storage. Avoid contacting sharp stuff. 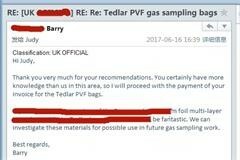 Before use, flush sampling bags three times with the gas you want to fill. The connection of valve and instrument or the equipment best be adopted correspongding latex tube or silicone tube transition. For sulphide and halogen gas, high content such as the percentage level or low content such as PPM level are not recommended to use. As the composite membrane using two-component adhesive when manufacturing, it can volatilize benzene, ketones, ethers, esters and other organics, So we should pay attention to the Aluminium-foil composite membrane separating out the residual organics can pollute the sample gas inside the bag,analysis data can cause interference. 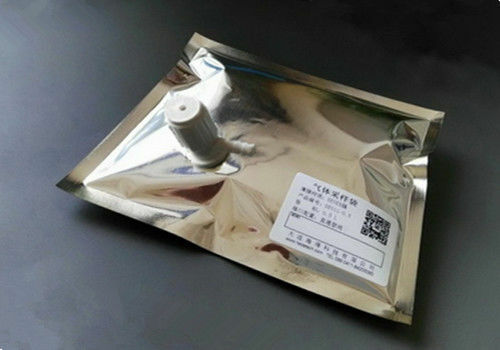 The sample gas in sampling bag to save time should not be too long,specific saving time depend on detection limit of experimental analysis requirement, gas component species, temperature and humidity, pressure, etc; generally, for pure inert gas, sampling bag can be used as a temporary storage container and recommended storage time less than 72 hours; for standard gas, flue gas, ambient atmosphere, recommended storage time less than 24 hours. High purity nitrogen gas heating replacement can reduce the interference of organic separating out. There must be a blank sample bag compare for precise experimental analysis to do background deduction. For high-temperature high-pressure gas should be down to normal temperature and pressure to sample, specific treatment method according to actual situation. For the gas containing particulate matter,dust and aerosols, should adopt filter to prevent polluting the sample bag, then difficult to clean up.